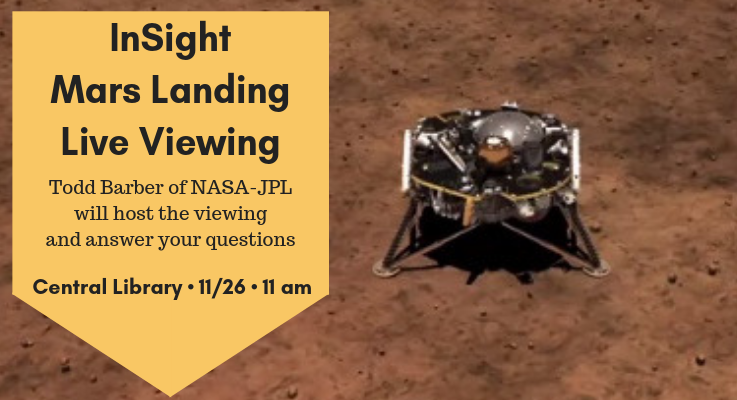 Join us on Monday, November 26 at Central Library for a live viewing of the InSight Mars Landing by NASA-JPL. We’ll have NASA-JPL’s Todd Barber hosting, and he can lend the expertise of his many missions (including Cassini and Mars Science Laboratory) to the event. The InSight mission is the first-ever to explore the heart of the “Red Planet.” While we prepare for science and technology to go where none have gone before, cozy up on Earth with one or several of these fictional titles about Mars. Happy reading, and Go, InSight! For centuries, war has raged on the dusty, red surface of Mars. This apocalyptic crucible will produce the solar system’s most fearsome warrior, Alita. But for now that warrior is just a little girl named Yoko. The future and past of the battle angel fan out across the reaches of space in the final chapter of one of the greatest sci-fi epics of all time! Egypt’s Western Desert in the 1880s provides the setting for this slyly satirical novel from National Book Award finalist Kalfus (A Disorder Peculiar to the Country). Convinced that intelligent life exists on Mars, famous astronomer Sanford Thayer has won worldwide backing to excavate an enormous equilateral triangle from the desert as a signal to the Martians. But a workforce of nearly a million Arab laborers, or fellahin, working toward a goal in which they don’t believe, combined with the arrogance of their British overseers, make for a combustible mixture. Thayer battles malingering illness as his self-imposed deadline approaches, while his chief engineer, Wilson Ballard, keeps the men in line with increasingly harsh methods, only partly tempered by Thayer’s trusted longtime secretary, Miss Keaton. Past romantic history between the two, coupled with Thayer’s new interest in Bedouin servant girl Bint, produces another kind of triangle. Kalfus wittily skewers the Europeans’ cosmic fantasies before reaching the ambiguous ending, which somewhat strains credibility but befits the story’s equal attention to the wonder of prospective first contact and absurdity of human self-delusion. This estate-authorized sequel to H.G. Wells’s The War of the Worlds is set in the early 1920s, but it has the feel of one of Baxter’s modern SF extravaganzas. It’s been 13 years since marauding Martians were vanquished by Earth bacteria, and the red planet is launching another invasion. The Martians have learned from their earlier experiences, but so have humans. Baxter presents this second conflict as one that pits the superior technology of the Martians against the guerilla ingenuity of scrappy Earthlings. The author takes a sweeping approach, providing a global panorama of the novel’s events, but most of the action is seen through the eyes of Londoner Julie Elphinstone, the former sister-in-law of the unnamed narrator of Wells’s novel (here named Walter Jenkins). Arabella, a human teenager born on Mars, is catapulted into adventure in a tale that cleverly combines some of the most intriguing elements of steampunk and classic science fiction. In an alternate 1812, Arabella’s mother moves her three daughters to Earth and away from the wild influences of the Martian colony. When the family gets news that Arabella’s father has died on Mars, the headstrong 17-year-old girl disguises herself as a boy and hires on with one of the great ships that sail the solar winds between the planets, planning to protect her brother, who’s still on Mars, from treachery. Along the way, she faces privateers and mutiny, but Arabella is resourceful and courageous, gamely enduring hardship to accomplish her mission. Arabella is a fully realized character, daring and willing to risk everything to protect the brother she loves and the legacy that her father has left them. Her wits and cleverness save the ship and crew more than once in this rousing swashbuckler. In this rollicking splice of mystery and high-tech SF, a smart-aleck spy forced to take vacation after a mishandled assignment plunges into perilous intrigues that no one on a pleasure cruise should have to face. Evan Rogers—nicknamed Kangaroo for his ability to store and retrieve items from an extra-dimensional “pouch” that only he can access—is Mars-bound on the passenger liner Dejah Thoris when he’s roped into the investigation of an onboard double murder. While he labors to solve the crime without blowing his cover, the murderer hijacks the ship, setting in course a series of potentially world-shaking events that tax Kangaroo’s nimble skill for saving the day. Chen’s debut keeps the plot twisting as the story builds to a powerful climax, leavening the suspense with Kangaroo’s droll quips. This book is an auspicious start for its author and his wisecracking series. Hugo and Nebula–winner Haldeman infuses this yarn with his teen narrator’s intelligent curiosity. Carmen Dula, part of the first human colony on Mars, looks like a typical young adult heroine: distanced from her parents, irritated by her bratty younger sibling and beset by tyrannical colony administrator Dargo Solingen. Then she accidentally discovers real Martians living in an underground city and has to convince Solingen that her story is true. When the Martians reveal a terrible threat to life on Earth, it’s up to Carmen and her friends to save the day. Recalling Robert A. Heinlein’s Red Planet and Podkayne of Mars, Haldeman updates the Martian setting while keeping faith in his characters’ ability to respond to unexpected challenges.